We were delighted when the fabulous Kate Heppel from Knit Now magazine rang to offer us a whole page in this excellent magazine. Publicity is very much appreciated by MSF & p/hop. The more people who know of p/hop and our patterns, the more money and awareness we can raise for MSF and the more people we can help. We are featured in issue 33 on page 77. I think the advert looks fantastic. 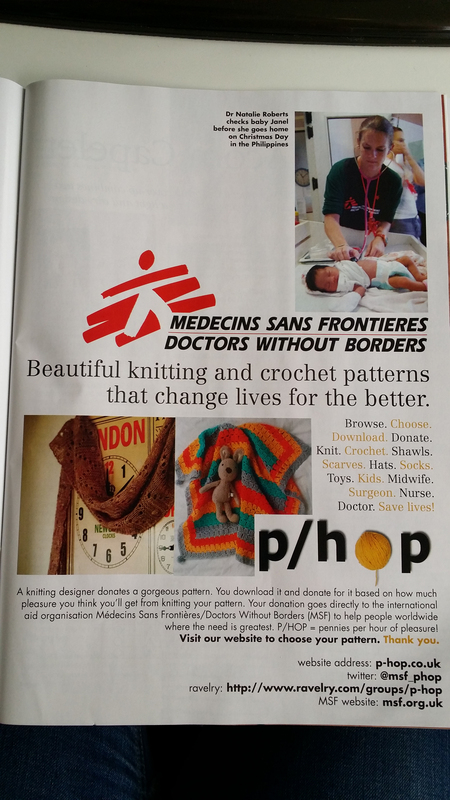 It’s great at creating awareness of MSF (Medecine sans Frontieres/Doctors withour borders) and shows off a couple of our lovely patterns. Please don’t forget to make a donation. ← What does £45,000 buy?